* Jewish View: Mark D. Nanos. - Publisher The apostle Paul was a vital force in the development of Christianity. Paul's historical and religious context affects the theological interpretation of Paul's writings, no small issue in the whole of Christian theology. Recent years have seen much controversy about the apostle Paul, his religious and social context, and its effects on his theology. In the helpful Counterpoints format, four leading scholars present their views on the best framework for describing Paul's theological perspective, including his view of salvation, the significance of Christ, and his vision for the churches. Contributors and views include: Reformed View: Thomas R. Schreiner Catholic View: Luke Timothy Johnson Post-New Perspective View: Douglas Campbell Jewish View: Mark D. Nanos Like other titles in the Counterpoints: Bible and Theology collection, Four Views on the Apostle Paul gives theology students the tools they need to draw informed conclusions on debated issues. General editor and New Testament scholar Michael F. Bird covers foundational issues and provides helpful summaries in his introduction and conclusion. 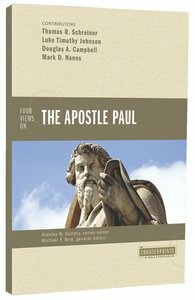 New Testament scholars, pastors, and students of Christian history and theology will find Four Views on the Apostle Paul an indispensable introduction to ongoing debates on the apostle Paul's life and teaching. About "Four Views on the Apostle Paul (Counterpoints Series)"
The apostle Paul was a vital force in the development of Christianity. Paul's historical and religious context affects the theological interpretation of Paul's writings, no small issue in the whole of Christian theology. Recent years have seen much controversy about the apostle Paul, his religious and social context, and its effects on his theology. In the helpful Counterpoints format, four leading scholars present their views on the best framework for describing Paul's theological perspective, including his view of salvation, the significance of Christ, and his vision for the churches. Contributors and views include: Reformed View: Thomas R. Schreiner Catholic View: Luke Timothy Johnson Post-New Perspective View: Douglas Campbell Jewish View: Mark D. Nanos Like other titles in the Counterpoints: Bible and Theology collection, Four Views on the Apostle Paul gives theology students the tools they need to draw informed conclusions on debated issues. General editor and New Testament scholar Michael F. Bird covers foundational issues and provides helpful summaries in his introduction and conclusion. New Testament scholars, pastors, and students of Christian history and theology will find Four Views on the Apostle Paul an indispensable introduction to ongoing debates on the apostle Paul's life and teaching. Customer Reviews For "Four Views on the Apostle Paul (Counterpoints Series)"
Growing up in a particular Roman Catholic church, I always had a strange view of Paul as a superhuman, demi-god of sorts. His exploits were given special treatment; he was heralded as the New Testament hero just inches short of Jesus Himself. When coming to biblical faith in the gospel later in life, I could make no doubt Paul was a remarkable individual, but he was just like the rest of us. Gifted and able just as much, but available and responding to the Spirit's prompting. This book makes for a great work in focusing particularly on Paul as a person, from 4 distinctly different and sometimes contradictory views. Included are 4 views from the following positions: Reformed, Catholic, Post-New Perspective, Jewish. This unique format allows those with a heart for worship to compare different perspectives and draw their own conclusions on what the Bible teaches. It engages the reader's faculties of critical thinking in a way that allows him or her to understand the various approaches to worship, carefully evaluate their strengths and weaknesses, and make personal choices without adopting a judgmental spirit. The goal of apologetics is to persuasively answer honest objections that keep people from faith in Christ. But of the several approaches, which is most effective? With a forum format, this book puts five views under the microscope: Classical, Evidential, Presuppositional, Reformed Epistemology, and Cumulative Case. Contributors: William Lane Craig, Gary Habermas, John Frame, Kelly James Clark and Paul Feinberg. 398 pages, from Zondervan.